Heartbreak is possibly one of the most BRUTAL experiences we all go through. It’s just like having a broken bone, but inside your body...and because no one can see the break, you often are left to suffer in silence. If you’ve recently gone through a breakup, hang in there. There is light on the other side of the breakup tunnel. We promise. We know you’re feeling all the feels, and not in a good way. The good news is, there are scientific reasons for why you’re in so much pain, and better yet, there are actions you can take right now to make the pain a bit less. We pulled together research from various scientific studies, and while we may not be able to bring back your ex, we can help you heal and make a little more sense of it all. 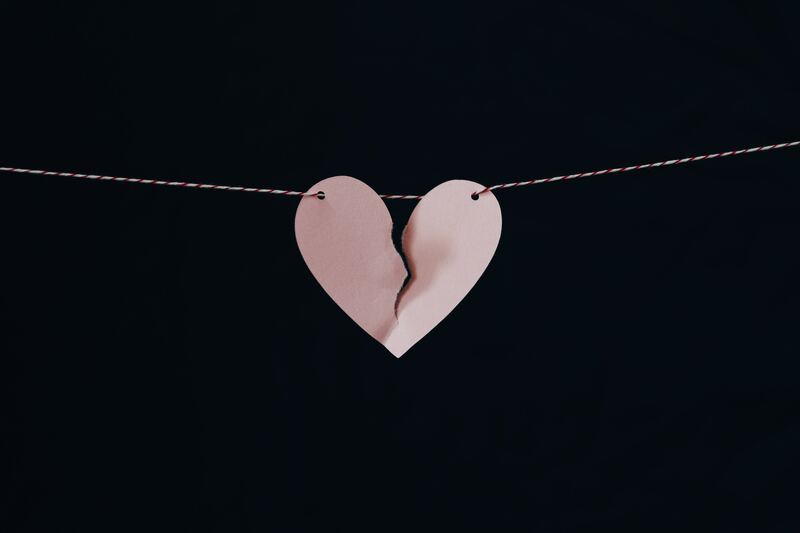 Take a deep breath, and follow these 10 steps to help repair your broken heart. Focus on your breathing for instant relief. Controlled belly breathing will calm your nervous system and ease feelings of stress, depression, and anxiety. Lay down and place a heavy book or any sort of weight on your belly. Breathe into your belly and see if you can watch the book rise. Exhale, and watch the book fall. Try inhaling for 5 seconds and exhaling for 7 seconds. Repeat for five minutes or until you feel more relaxed. Use belly breathing as your weapon against anxiety. If you need a little help in getting your breathing technique right, come on over to the Happy Not Perfect app and check out our easy video tutorials and guided exercises. Researchers have identified 175 brain cells which spy on your breath and alter your state of mind accordingly. When you take a deep breath into your belly, these neurons are signaled in your brain and tell your body to relax. You really do have the power to change your emotional state! Now that you have this powerful relaxation tool at your fingertips, it’s useful to understand why your body is reacting in such a harsh way. When you're in love, certain areas of your brain are happily bathed in dopamine and oxytocin, the pleasure hormones of your body. When your partner leaves, your supply of those feel-good chemicals starts to tumble, leaving you more vulnerable to stress hormones. Learn how to manage the dip by incorporating endorphin boosting activities into your daily routine. Exercise stimulates the release of happy hormones, replacing the ones you recently lost. Your brain needs endorphins, a pleasure chemical, now more than ever! It’s the perfect time to work towards those recommended 10,000 steps per day, so get outside or hop on a treadmill. Walking can be very meditative and help you to process your emotions. The correlation between mood and exercise is STRONG. Exercise changes the structure and function of the brain for the better. It improves blood flow to the brain and triggers the growth of new neurons, essentially restoring what is broken. Learn to let the feelings out and bring the good stuff in. A great way to release your emotions is to talk them through with someone, or write them down if you have run out of people to vent to. Writing your feelings down on paper is just as helpful! Journaling encourages freedom of expression. It also lowers stress and anxiety, and can even improve your sleep. All quite useful when dealing with heartbreak. Write down your thoughts and then BURN THEM! Grab your pen and write down every single emotion you’re feeling right now. When you allow yourself to sit with an emotion for a moment, instead of rejecting it, you are making it easier to process and release. Don’t edit yourself. Just let the writing flow, and feel the emotions release. Head to the Happy Not Perfect app for more on THE BURN BIN. When you write things down, you activate the prefrontal cortex, the computer side of the brain. This also relaxes the emotional center, allowing you to remove mental blocks and fully express yourself...something you really need to do right now. Mind racing late at night? This is also a useful exercise to do before bed to clear your head. Processing emotions in a healthy way - check. What else can you do? This is an important, yet difficult, step to follow. In the days, weeks, and months following the breakup, you may be tempted to reach out to your ex and try to reason with him or her. Maybe you’re telling yourself you can become friends. Perhaps one day, but right now, try your best to keep your distance. If you are really looking to heal and take care of yourself, it is best if you limit your contact all together. Unfriend and unfollow your ex on all social media platforms. Tell your closest friends that you are going “no contact” with your ex and ask for their support. When you feel tempted to reach out or take a look to see what your ex is up to, stop, and phone a friend. The healing process takes time, but this can help speed up the process. Treat your broken heart as a wound, and allow your brain time to readjust to life without your ex. Once your body chemistry returns to normal, you can reevaluate your level of contact. Love is like your brain on drugs. Literally. You’re still craving your ex because your brain is in withdrawal, much like a brain that’s addicted to cocaine. Without this person, your body is practically begging for another hit. Recognize that what you’re feeling is incredibly intense, and give yourself time to get through it. Romance increases your feel good hormone dopamine supply. During the romance, it feels great, and you want more. When the source of your dopamine supply (aka your ex) is no longer available, your brain goes into a withdrawal state. So do not worry if you feel out of sorts. It’s not you, it’s your hormones! STEP 6: DON’T BE A VICTIM. CHOOSE GRATITUDE. It’s easy to think you’ve lost everything. To think “of course it happened to me” or “I can never catch a break”. But this way of thinking doesn’t help us mentally or physically. Instead, try to flip it and challenge negative thinking with gratitude! What are 3 things I am grateful for today? Write them down here. Shift your focus towards the good things in your life in our Happy Not Perfect Appreciation Station. and/or Use the grateful diary on Happy Not Perfect. Gratitude raises happy hormones, boosts the immune system, and helps to change your perspective. It is a simple, yet effective, way to focus on the positives and reintegrate joy back into your life. Perhaps now you’re wondering why a breakup hurts so much? You wouldn’t be running two weeks after you broke your leg. Treat a broken heart the same way. It needs a LOT of rest and recuperation! Why? Physical and emotional pain occur in the same part of the brain. The brain reacts to emotional pain similarly to physical pain -- the same neural area lights up. A lot of symptoms may arise in this time of mourning, so whether you’re experiencing a first degree burn or rejection, what you’re feeling is absolutely real. Respect it. Perhaps the most important thing you can do right now to take care of yourself is to make sure you get proper rest. It may be difficult to sleep through the night at the onset, but there are several tricks you can implement to increase your overall sleep quality and pick up good habits. When you don’t get enough sleep, your emotional regulation can be out of whack. Sleep serves to re-energize the body’s cells and helps to stabilize your mood. A lot goes on in your body when you’re asleep, so give yourself ample time to rest and restore each night. Combat low self-confidence by using positive affirmations. Select an affirmation for this week and write it down. Then read your affirmation each morning, throughout the day, and before you go to bed. Check out the affirmation series on the Happy Not Perfect app if you need inspiration. Studies have shown that those who practice affirmations have greater activation in parts of the brain that are known to be involved in expecting and receiving reward (the ventral striatum and the ventral medial prefrontal cortex). You’re helping your subconscious brain tell your conscious brain that you are OK.
It’s OK to go on a shopping spree and it’s more than OK to eat those carbs. Carbs apparently aren’t as bad as everyone once thought (and who cares post break-up anyway)? The best way to get optimal effects, is to enjoy a low-fat, low-protein, high-carbohydrate snack, like toast with honey or jam. This ratio allows an amino acid called tryptophan to flood your brain and turn into serotonin, which boosts your mood, helps you tolerate pain, and can even make you sleep better. Allow 30 minutes for it to take full effect. If shopping is more your style, good news. It turns out, money can buy you happiness. BUT only if you spend money on happiness-boosting things. Studies show that spending money on experiences, gifts for others, and services that free up your time can actually make you happier. So why not buy your friend a coffee today, and then send yourself a gift? Flip the focus off yourself for a moment and think about what you can do for others. Whose spirit can you boost by practicing an act of kindness? Emotions are proven to be contagious, so by you making an effort each day to do one thing for someone else, you will spark a ripple of positivity. It’s the small things that help people know they are appreciated. Friends or strangers, everyone remembers kindness. Practice at least one act of kindness towards another person today. Open the door for someone. Treat the person in line behind you to a cup of coffee. Smile at a stranger on the street. Send a compliment on Whatsapp. Or use our HNP app to send a vibe! Studies show that the happiest people think and do stuff for others the most. When you practice kindness, you receive more oxytocin, a happy hormone that increases self-esteem and optimism. Studies have also shown that you may have decreased pain, increased energy energy and even live longer! What do you have to lose? Congratulations! You have already done a lot of work. Don’t stop now. Keep this checklist handy to make sure you continue to take care of yourself. It’s important to recognize that what you’re feeling is totally normal. While the loss of a relationship can feel downright devastating, these feelings will subside eventually. You WILL recover! Remember, love is more addictive than drugs, so cut yourself some slack and give yourself time to deal with the withdrawal. No matter what, never stop feeling your feelings and make sure you keep being kind to yourself. PS: Want more resources to help you heal from heartbreak and take care of your emotions? Download the Happy Not Perfect App for free and check out our meditation series “3 Steps To Getting Over Heartbreak” to help ease your pain and regain your strength. Plus you’ll have access to 50+ science-based games, exercises and zenning sessions to help you be in charge of how you feel.